But Jewish women’s history is nothing if not diverse. These women fought for women’s advancement, but did not buy into women’s suffrage as the mainstream saw it. Today is also the 40th anniversary of the Women’s Strike for Equality, when Betty Freidan led a slew of women’s organizations in a march down New York’s 5th Avenue to demand free abortion on demand, free 24-hour community-controlled child care centers, and equal opportunity in jobs and education. Ten years later, a second march was held to mark the 10th anniversary of Women’s Strike for Equality and the 60th anniversary of women’s right to vote. To see how we are commemorating the 90th anniversary of women’s right to vote today, take a look at these articles and blog posts both celebrating this historic victory, and asking: have we achieved real equality? 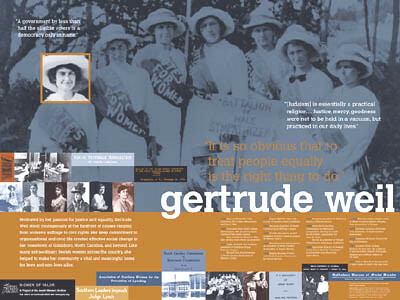 If you would like to support JWA and our mission to uncover, chronicle, and share the rich legacy of Jewish women’s history, why not buy a poster of Gertrude Weil or another suffrage activist? These posters ($5 each, $25 for the whole series of 18) have been displayed in museum exhibits, offices, bedrooms, classrooms, and even bathrooms! Where would you like to be inspired by a the story of a Jewish woman who made history?